As the weather gets colder, there is something lovely about sitting down to a warm lunch: it affords us a slow, heartening moment in the middle of our day which is good for the soul. I’ve been collecting ideas for simple, healthy, warming lunches for this time of year. Some, like the squash and feta salad, are perfect for a lunchbox, others, like the grilled courgettes, for a quiet meal alone at home, and others, like the roast chicken and cous cous, for sharing with friends and family. Boil 1/2 a celeriac, 2 apples and 2 potatoes in vegetable stock, adding salt and pepper. Once softened, blend and serve with cheese, bread and nuts. Roast some chopped squash, adding the feta in chunks for the last 10 minutes or so. Toast sliced almonds in a pan for a couple of minutes until golden then sprinkle over the roasted squash and feta. Serve with rocket or spinach leaves. I use a recipe from the Kinfolk Table, but you can combine pearl barley with a range of ingredients. Boil it until soft then mix with tomatoes, olives, peppers or any number of other ingredients. Works with pesto too, and great served with rocket or spinach leaves. Combine halved cherry tomatoes, chickpeas, chopped chives or red onion, olive oil and lemon juice. Chop the ends off your courgettes and halve them. Sprinkle with sea salt and chilli flakes and drizzle with olive oil, then grill them. Serve with salad or cous cous. Roast your chicken with a halved lemon inside and plenty of rosemary sprinkled over it. Place your cous cous in a bowl with chopped spring onions, some mixed herbs and lemon juice. Cover it with boiling vegetable stock, place a plate over it and leave for a few minutes. Take the plate off, use a fork to fluff it up, and serve with the chicken and a green salad. 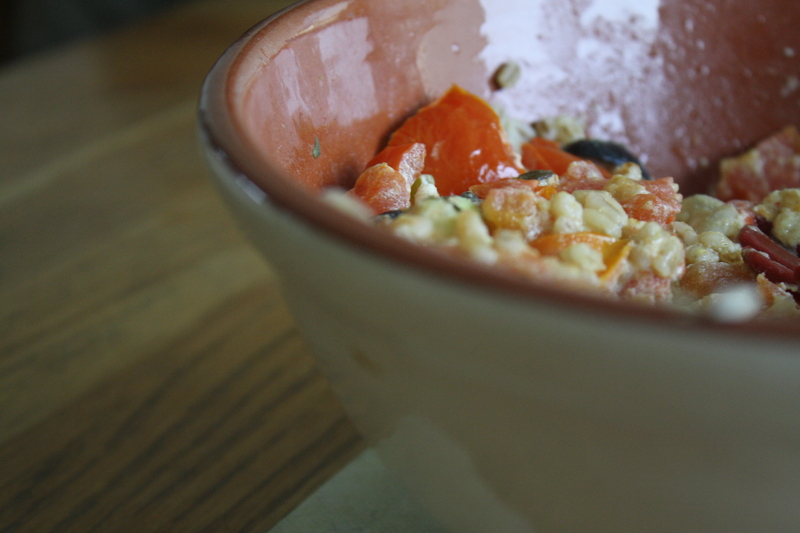 You can also add vegetables to the cous cous, such as peppers, courgettes and squash.